Ideally, your company has the resources to support a full Chief Information Officer and a Chief Security Officer. The modern IT landscape demands require most companies now retain that deep knowledge of digital systems if they want to remain competitive. Not to mention how vital it is in managing risk and cybersecurity. But in reality, companies have to prioritize their budget in ways that don’t make that possible in-house. Decisions have to be made based on cost-benefit analyses of foregoing that expertise in order to support other departments. Perhaps the growth just isn’t there yet — maybe the constraints of your business model even mean that you don’t foresee a CIO or a CSO as a full position in your company indefinitely. 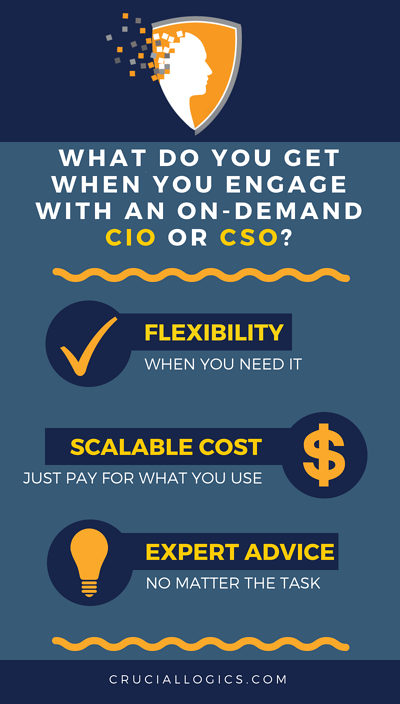 For these situations, we recommend an on-demand CIO or CSO service. You get all the expertise of a relevant IT expert with expertise in your area, without the overhead of hiring one yourself. The flexibility of the on-demand service means you pay for the time you need. If you’re a technologically light company, and you just need someone to get a few emails hooked up and check in with updates on occasion, you may only need to pay for a handful of hours all week. But if you’re managing a busy office that does business online and a team that needs the latest Office 365 environment, you might want a deeper engagement. Then finally, if you have large, one-off projects that don’t necessitate long-term staff, you can simply get your IT advice and leadership for those specific periods. Maybe you just need to get a cloud migration done, or you want to make the jump to Windows 10. Either way, your on-demand IT expert can help develop, execute, and support the plan as you need. Having the services of a CIO or CSO come with the obvious benefit of IT safety and security you’d otherwise lack. They can help evaluate security, identify and account for holes and risks before the attackers get in, and produce a smart, reliable backup and disaster recovery plan designed to give the integrity of your environment that extra level of assurance should the worst happen. At the same time, partnering with an IT firm for your CIO/CSO needs means you’ve eliminated the risk around hiring your own — allowing you to focus on what you do really well instead. If you hire the wrong CIO, it can take a long time to understand the mistake and adequately resolve it. An IT partner, on the other hand, has access to a diverse set of resources that makes it easy to design a service with the right fit for any organization. At CrucialLogics, we have that access, and we’ve seen incredibly things happen at companies that give the on-demand service a whirl. We’re able to empower their success through technology without them getting caught up with expensive up-front staff and infrastructure. No matter the size of your organization, our Consulting and Advisory Practices accelerate your digital journey and create outcomes that transform your business. Need some info for financial professionals and CFOs?